As one of the exhibition series during the theme academic month titled “Design. 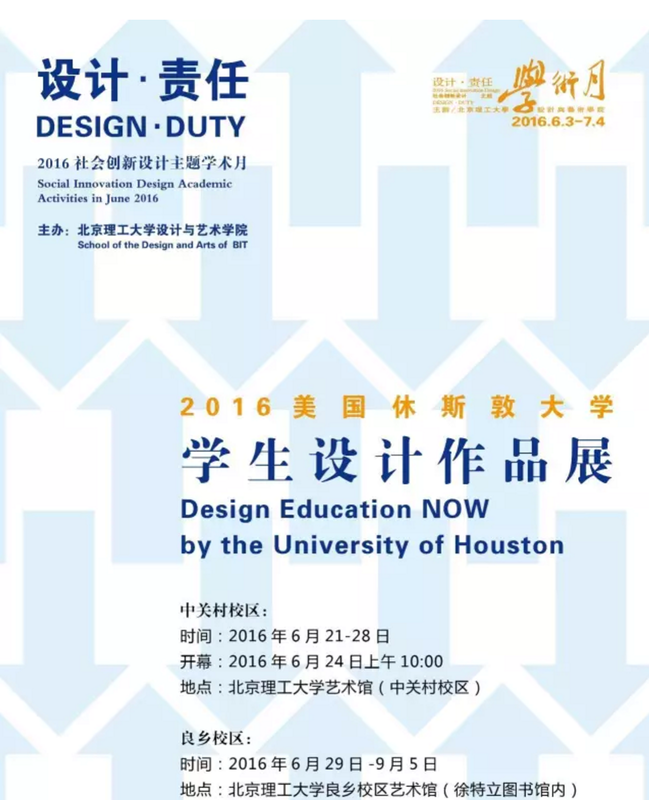 Responsibility” in 2016, the design works exhibition of the students from Houston University will be held in the Art Gallery of Beijing Institute of Technology (Zhongguancun campus) during 21 th -28th, June. The opening ceremony will be held at 10am on the morning of 24th. The works in this exhibition will mainly focus on the ones from undergraduates of the Department of Industrial Design, Architectural Institute of Houston University, with a total of more than 40 pieces. After the exhibition finished in Zhong Guancun campus, it will be moved to Art Gallery of Liang Xiang campus (inside Xu Teli Library) from 29th, June---5th, September. Welcome the visit and guidance from all experts, colleagues and students in the design circle.